What happens if you want to sell your home before the end of a fixed year mortgage? When you got your mortgage you shopped around for different options, eventually found a good deal, and likely settled for a five-year mortgage, with a fixed or variable rate. Then after three years, you decide to sell your property. You still have two years on your term. This means you’ll have to break your mortgage contract in order to sell. You call the bank to find out how much it will cost. When the voice on the other side of the phone tells you the figure, you can’t believe what you are hearing. Why Is It So Expensive to Prepay Your Mortgage? You’d think that lenders would love you for paying out a loan early—but that isn’t the case. Lenders don’t want you to pay your loan early because they want the interest payments. Mortgage contracts include specific language regarding the penalties you need to pay if you want to prepay your mortgage. Whether pay the whole mortgage off in cash, or by switching to a new mortgage, you’ll most likely have to pay these (often) astronomical penalties. That’s why, before you sign a new mortgage contract, you’ll want to know exactly how much these penalties are. How Much Will It Cost to Break My Mortgage? The amount of money you’ll pay in penalties for breaking your mortgage will depend on the type of mortgage contract you have. Variable rate mortgages are mortgages in which the interest rate is adjusted periodically to reflect market conditions. If you have a variable rate mortgage, the penalty you’ll have to pay for breaking your mortgage is of three months of interest on your current balance. In other words, if the current balance on your loan is of $100,000 and the interest rate on your mortgage is 2.79%, you’ll be paying $697.50 in penalty. 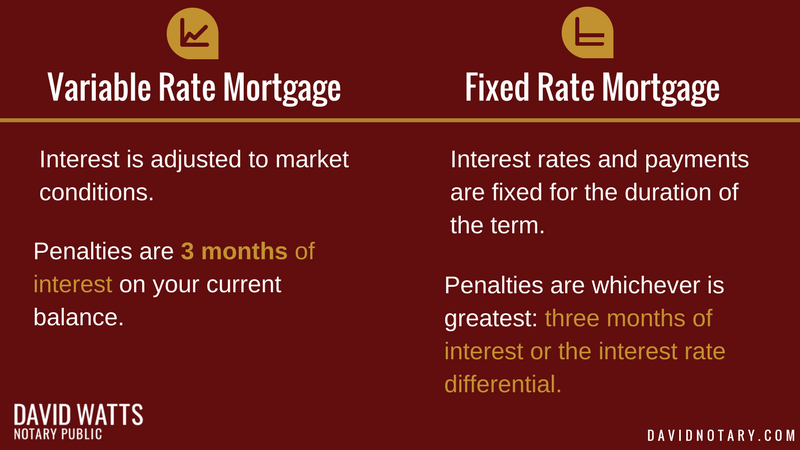 A fixed rate mortgage is a mortgage in which interest rates and payments are fixed for the duration of the term. This type of mortgage provides monthly financial stability, but calculating the penalty for breaking your fixed rate mortgage is complicated. The general rule of thumb in these cases is that when you break a fixed rate mortgage you will pay whichever is greatest between the three month interest or the interest rate differential. First, calculate your three month interest rate using the same equation as above. Here’s what that would look like using the example above. Then, figure out what your interest rate differential (IRD) is. For this, you’ll need to know the following four things: the current balance on your mortgage, your original rate, the rate you can get now and the remaining number of months in your mortgage term. This information can normally be found on your online banking profile. Using the same example from above, let’s assume that the current balance on your mortgage is $100,000, your original interest rate was 2.79%, the current rate is 2.59%, and you have two years (24 months) remaining in your mortgage term. In this case, your interest rate differential is $400. In this example, because the three month interest ($697.50) is higher than the IRD ($400), your penalty will be of three months interest rate. In many cases, however, your IRD will be much higher than the three month interest. Many times penalties are in the thousands or tens of thousands of dollars, meaning that you may need to reconsider whether or not to break your mortgage. Also, some lending institutions may use different methods to calculate your interest rate differential, including variables like discounts and advances. Make sure you ask your lending institution how they calculate IRD. Next, go to the Penalty Calculator on Ratehub.ca and fill out the information about your mortgage. An example is a 3 year mortgage for $100,000 with HSBC with a 2.79% interest rate would have a $75 penalty on a variable mortgage, but a $3175 on a fixed rate. The same figures with CIBC is estimated about $875 on variable and $3875 on fixed rate. It shows that rates are different for every bank and mortgage. Is There Any Way I Can Avoid the Prepayment Penalty? 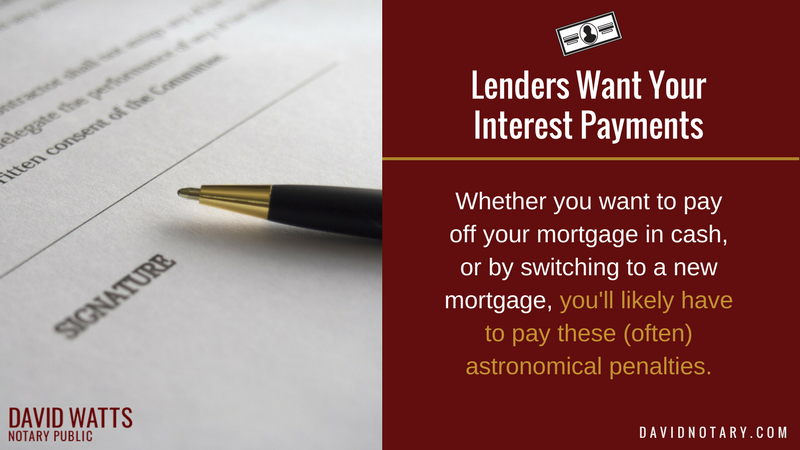 Here are a few things you can do to avoid paying astronomical prepayment penalties. Your mortgage will most likely be the most complicated document you ever sign. That’s why it’s important that you review your contract thoroughly before signing it. This includes looking specifically at prepayment penalties. Get some help with this from an expert, and make sure you know exactly what you are signing. Some mortgages include clauses that allow you to pre-pay up to 20% of your mortgage balance per calendar year without a penalty. 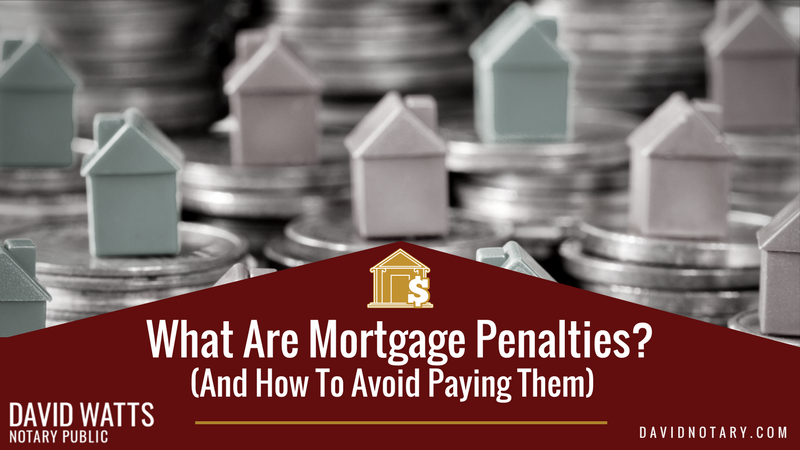 If you have calculated your penalty and figure out it is going to be astronomical, you can pay down up to 20% of your mortgage, and incur the penalties on the reduced balance. If you’re looking to buy a new property, one of the ways to avoid paying a prepayment property is to port your mortgage. This means taking your existing mortgage—with its current rate and terms—and transferring it from one property to another. This can only be done if you’re buying a new property at the same time as you are selling your old one, and needs to be approved by your lending institution. If you are selling your house, this means transferring your mortgage to the buyer. Not all loans will allow you to do this (most won’t, in fact) but it could be an option if your contract allows it and your differential is very high. Ask an expert to look at your contract to make sure you qualify for this.